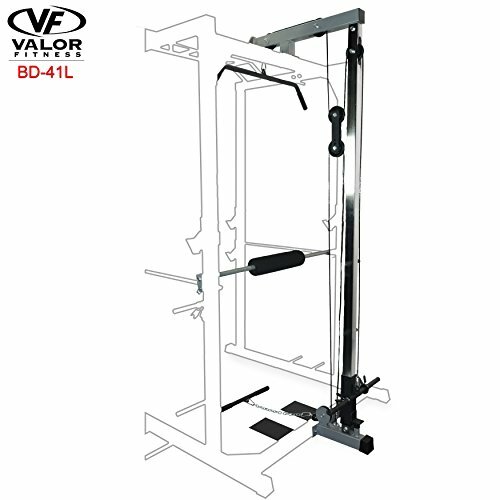 The Valor Fitness BD-41L Lat Pull Attachment, constructed of 12-gauge steel 2.5" x 2.5" frame, transforms the BD-41 Power Rack into a complete home gym. Adding the Lat Pull Attachment increases the variety of exercises to include Lat Pulls, Triceps, Upright Rows and Curls just to name a few. Foot plates provide additional comfort when performing seated row exercises. Includes 38" lat bar, 20" accessory pull down bar, and a padded lap bar to keep your body secure during the lat bar exercise. Max weight load is 250lbs. Warranty: 3 Year frame, 2 Year cable, 1 Year pulley. Travel distance of cable is 60"
If you have any questions about this product by Valor Fitness, contact us by completing and submitting the form below. If you are looking for a specif part number, please include it with your message. Valor Fitness 700lb Rated Olympic Bar, 86"